About the CRASH - Capt. Dale Black - Author of "Flight To Heaven" and "Life, Cancer & God"
I was the only survivor of a horrific airplane crash and my life has forever been changed. As a nineteen-year-old brash young pilot in flight training, I boarded a commuter airplane – full of cargo – with two other pilots. 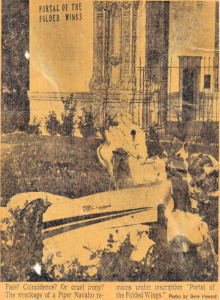 Just after take-off, we violently crashed into a cemetery’s seven story Air Mausoleum. Ironically it was dedicated to famous deceased pilots. The first witnesses to the crash site determined that all three of us were dead. For three days I drifted in and out of a coma but not before taking an uncharted trip … to heaven. What I experienced there, words cannot do justice. Even the best words pale before the indescribable. You should know, however, that for many months following the crash, due to serious amnesia, I remembered nothing. Nothing of the crash, the 70-foot fall in a tangled mass of metal, the first three days in the hospital, nor my visit to heaven. At least, my mind did not remember. My heart? Well, that’s a different story. I was assigned to Dr. Homer Graham, the “doctor of the stars.” Best known as daredevil Evel Knievel’s surgeon. My injuries were massive, but when I awoke in the ICU, I was a changed man. Yet I had no memory as to why. It seemed as if I had been given new and STRENGTHENED eyes. I felt as if I were looking into another dimension. It was like watching a movie, then putting on special glasses and realizing that the movie I was watching all along was in 3-D. But when I awoke I was seeing way beyond 3-D. Everything was in, well, let’s just say, 5-D. A “filter” that had seemingly been over my eyes since birth had somehow been removed. That was over forty years ago. What I speak about now, is how and why my life was turned upside down. Why every major decision I’ve made since the accident was a direct result of my journey to heaven. You’ll learn why I’ve been emboldened and compelled to share the love of God with others. You’ll learn why I volunteered on almost a thousand hours of flights to more than 50 countries—building churches, orphanages and medical clinics. You’ll learn why I’ve trained lay ministers and medical personnel to help the needy worldwide, usually at my own expense. 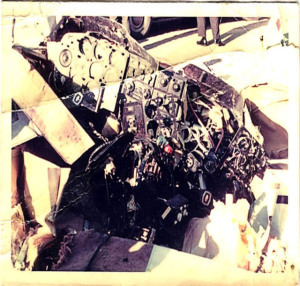 Since that fateful day in 1969, I have shared my story about the crash and the amazing recovery many times. But I have seldom shared publicly about my journey to heaven. How could I keep this life-changing event a secret? There are several reasons. After the crash I remembered almost nothing. My memory was like a jigsaw puzzle with only a few recognizable pieces. It would take six months to start getting my memory back. And even longer for my injured mind and my transformed heart to get in sync. I made a solemn vow to myself and to God not to share this experience with anyone until He made it clear to do so. I figured I might keep the story private for a year or two. But it would take forty years to be convinced that it was God’s time to share my experience publicly. Soon after the crash I attended a church service where a man claimed to have died, visited heaven, and came back to life. The service was more sensational than sacred. The very essence of heaven is God, yet the people were more interested in the man and his amazing story, than the One who created it all and whom heaven is all about. I was grieved by the event and my reluctance not to discuss my journey with anyone was further solidified. Another reason it wasn’t hard to keep my story to myself is because at various times in my life, I have been truly disappointed in myself. Why couldn’t I have lived an even better life? Since I had clearly seen heaven, and was so changed by the experience, why did I fail again and again to be the man I truly wanted to be? Why did I fail often to be that reflection of what I had seen and heard and learned? I guess seeing heaven didn’t change the fact that I’m human. And not only very human—but also very flawed. When I speak about my flight to heaven, I try to reveal some of the journey from a life that was imperfect… but was miraculously changed… and that is here today to tell that while heaven IS real, the God of the Bible is what THIS life is really all about. When I speak wherever God opens doors, my hope is that I will reveal what I was shown; accurately, humbly and straightforwardly. I hope especially that God will use my story in the lives of others in ways I could never imagine. My story is not about me ultimately, nor should it be. It is about God. And it is about you. The two of you individually. The two of you together. Entwined in a story that to me, is still breathtakingly sacred. I’ve flown thousands of flights since that July day so long ago. But on each and every flight I have reflected back on the crash, the death of two friends, my survival and miraculous recovery, my amazing visit to heaven – and how God is my Savior, my Lord and my best friend.